You’re in your car when a serious quake hits. What to do? Carefully get out of traffic and stop. If you resume driving, watch out for problems with or on the road. Get an emergency back pack kit for your car and have a comfortable pair of walking shoes in your trunk. And a little extra water. Expect roads to be impassable and be prepared to be walking home or to a shelter. Expect after-shocks. 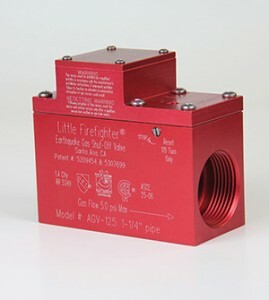 The Little Firefighter automatic gas shutoff valve. And speaking of HOME, if you want it to still be there when you get back, have us install an automatic gas shut-off valve and have your retrofit checked. If land/cell phones are working, DON’T call 911 with questions: they will be busy with emergencies. Call a designated, out-of-state person to “phone tree” others. Then stay off the phone! Change your voice mail message to state that you are safe. You may have to wait for a dial tone. Be patient – don’t hang up and try again. 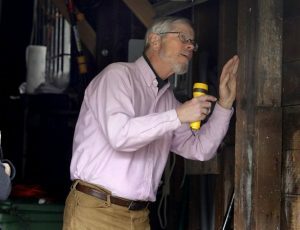 If you’ve been putting it off, my in-home QuakeConsult (quakeprepare.com/quakeconsult) is still $345 in most of the SF Bay area. It covers an assessment of your retrofit + a lot more. I’m guessing 5% of bay area homes have an automatic gas shut-off valve. If you’re one of the 95%, you might want to contact me to get the cheapest fire insurance around: still $245 in most of the SF Bay area. This Sunday, October 21, 2018, is the 150th anniversary of the 1868 rupture of the Hayward Fault. Seismologists know that it has ruptured every 150 years, on average. The Hayward runs through one of the most densely populated areas of any known fault. The Hayward is connected to the Rodgers Fault, which runs from San Jose to north of Healdsburg. It is likely connected to the Calavaras, which runs through much of the valley east of the Hayward. There are different views among experts as to where your emergency supply of food should be stored. Some insist that it should be outside because of the potential difficulty of getting to it in the house if there is structural damage after the quake (e.g., if you have it in a closet and the door is jammed and won’t open); or, if the house is so damaged you can’t safely stay in it. Others think it’s better to store food in the house, say, under beds or in a closet. This lessens the concern about the food going bad. I’ve also had more than one person say their container outside, even though it was sealed, took on water and ruined sleeping bags, blankets, etc. My inclination is to go with keeping emergency food inside (other than the garage). Even if you have to temporarily abandon the house, you can still take it with you. If you opt for a closet, that’s just another reason to keep a crowbar under your bed – in case you have to pry open a door. It’s called the automatic gas shutoff valve. We have installed over 3,250 of them in the SF bay area. Our cost for standard installation is $245 – $295, depending upon location. In the east bay it’s $245. If you already have one, why not get your whole neighborhood organized to get other folks to do the same? Makes everyone safer. Contact me – I can help you do this in the most effective way. What would you do if you were given the knowledge that, in exactly 90 days, a huge quake was going to occur near you? Would you have your retrofit checked or completed? 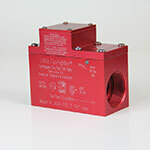 Would you get that automatic gas shut-off valve installed? Would you secure your furniture? Would you get the back-pack kit for your car? True, we don’t know that a major quake is going to happen in 90 days, but we DO know that it’s coming, right? Maybe this is the time for you to help get your block, or your whole neighborhood, organized to have the automatic gas shutoff valves installed. We have done many dozens of neighborhoods in the east bay. Contact me – I can help you get started. We’ve now installed over 3,200 gas shutoff valves.